The Cambio de Colores library features selected research and best practices papers on the integration of Latino and immigrant newcomers in new destinations. This resource is created by a community of practice and made available as a tool for all people who are members of, work in, and lead changing communities. With the latest research findings, the sharing of experiences, and the exchange of ideas, this interdisciplinary library is made available free, as part of the university’s land grant mission. The Cambio Center works with conference participants, authors, and faculty to review and edit the abstracts and selected papers to create the Proceedings Books of the Cambio de Colores annual conference. The primary editors over the past several years have been Drs. Stephen Jeanetta and Corinne Valdivia. Student assistants at the Cambio Center provide copyediting and layout and design expertise to create each book. The selected papers from all of the proceedings can be searched using the Cambio Center’s digital library hosted by MoSpace. 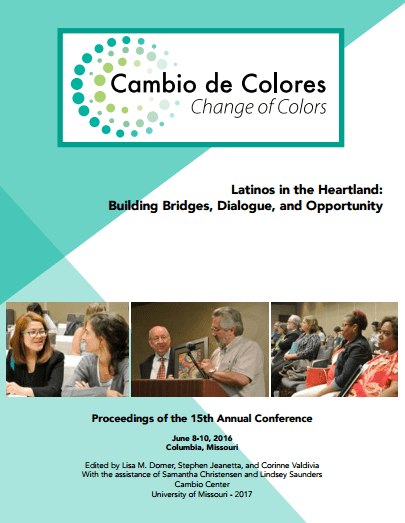 Cambio de Colores – Latinos in Missouri. Cambio de Colores Conference Abstracts. Latinos in Missouri: Beyond Borders, 2006. Latinos in Missouri: Everyone Together—Todos Juntos, 2007. Latinos in Missouri: Uniting Cultures—Uniendo Culturas, 2008. The program pages of the past conferences show the breadth and depth of the research and best practices discussed annually, as well as links to much of the conference material.